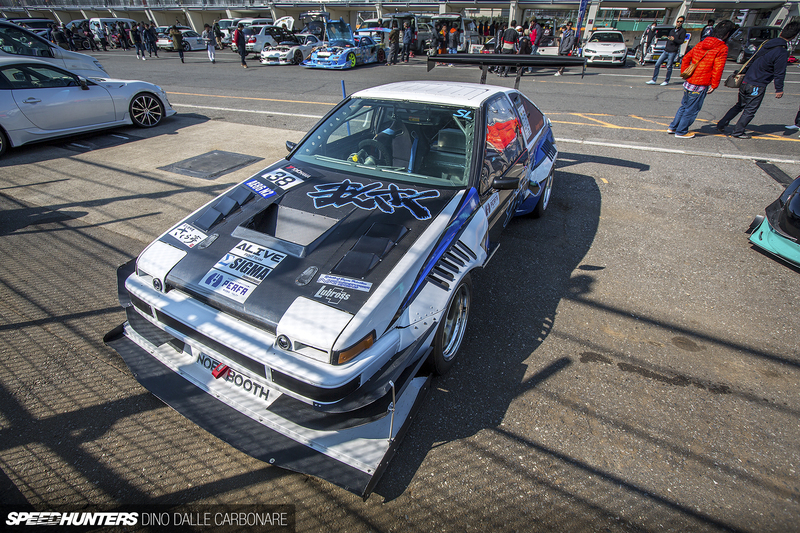 The assortment of cars that you find at Tsukuba Circuit time attack events is always one of the most impressive aspects of the JDM grassroots grip scene. Sure, you need massive power and extensive aero to play with the big boys, but most of the people out there are just trying to have a bit of fun while attempting to smash their own personal lap records in the process. 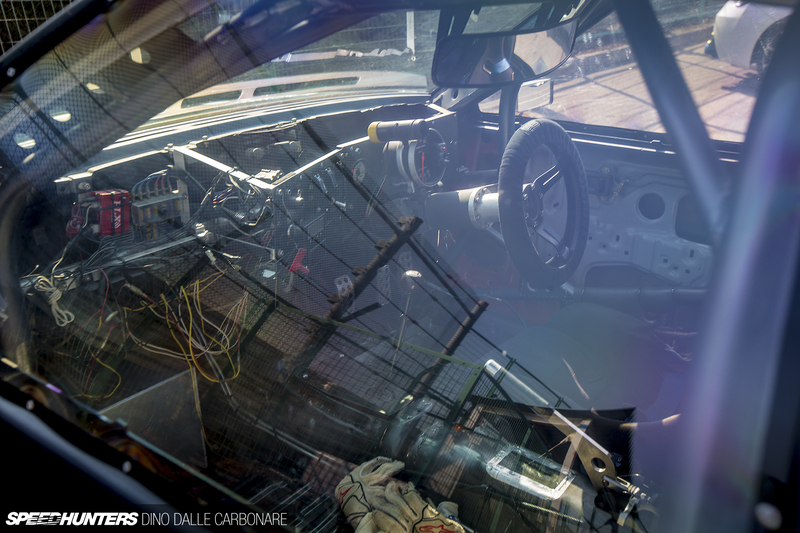 Making changes and adjustments along the way is a big part of time attack, and seeing a car evolve in incremental steps brings a lot of satisfaction to those who compete in the motorsport. That’s why it doesn’t really matter what car you start with; the important thing is the effort you put in. To say that everyone who took part in the recent Attack meet was giving it 110 per cent, would be an understatement. This AE86 Toyota Trueno built with tuning shop Mansaku Jidousha is one car that certainly deserves a mention, as these days you don’t see many examples being used for time attack purposes; most are flung around at drift soukoukais more than anywhere else. 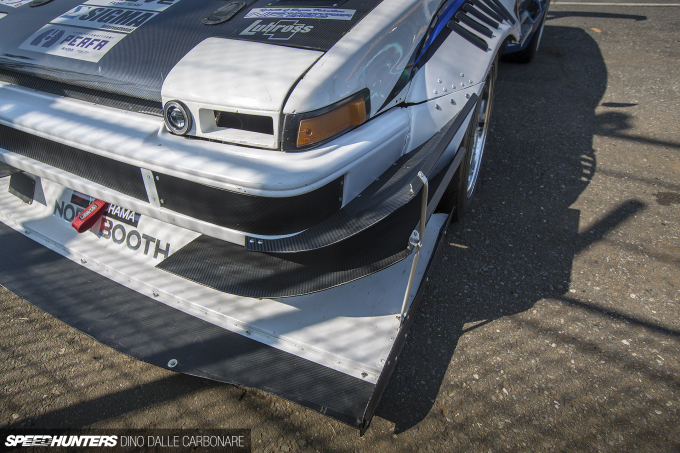 But let’s not forget what a lightweight car like this (810kg in this stripped-out instance) is capable of. Under the hood the car runs a fully-built 4A-G boasting around 180 naturally aspirated horses, but it was the exterior that drew me to it in the Tsukuba pits. It looks like the owner not only concentrated on shedding as much weight as he could with lots of FRP and carbon, but took the opportunity to go all-out in the aero department, too. At the front end, the snowplow-style front splitter is the first thing you notice, followed by the vented and widened overfenders. But nothing can prepare you for the rear wing! 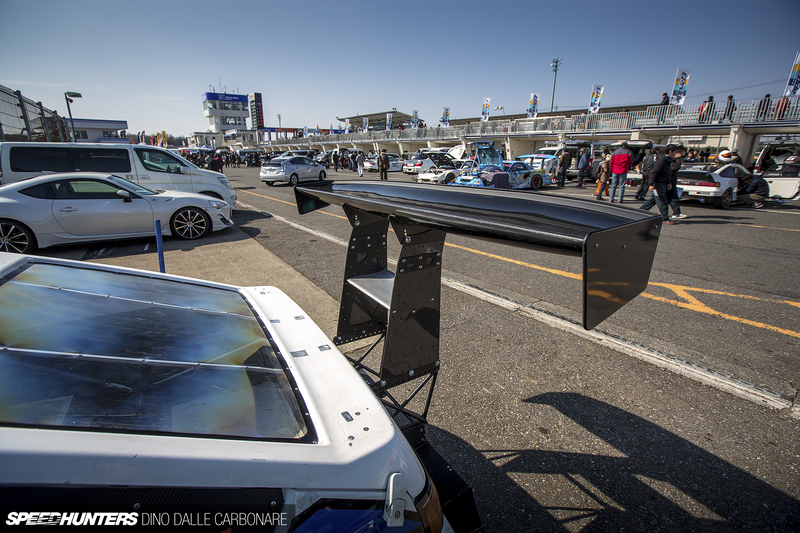 I can’t even imagine what an 810kg car with this much downforce would feel like around a fast bend, but the driver must not even touch the brakes for Tsukuba’s final corner onto the front straight. And it’s properly mounted and supported in order to fully utilise the produced effect. I’m not sure if cutting out so many openings in the rear overfenders has any aerodynamic benefit, but it sure is unique. They also give you a glimpse of just how much metal was cut away from the stock steel arches to get the wide Work Meister wheels to fit. The interior may resemble a time machine in full test mode, but that’s because pretty much every single bit of trim has been thrown out. 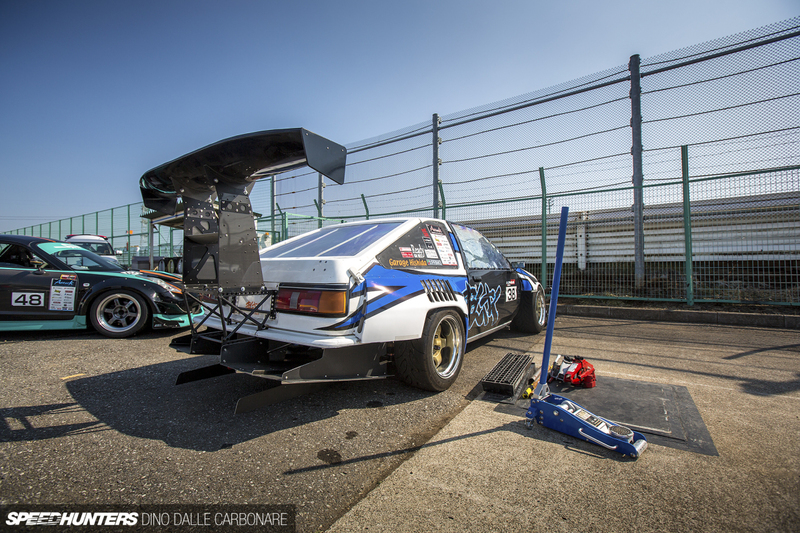 The result of all this at Attack Tsukuba last month? A respectable 1’00″985 lap time. not to take away from the build and the 1 minute lap time, but is there a chance that this much aero on a car with only 180hp might drag it down quite a bit? In the straight line , in theory all the drag would slow it down ... but should be balanced out by epic cornering speed thanks to downforce , and again I'm speaking in theory . 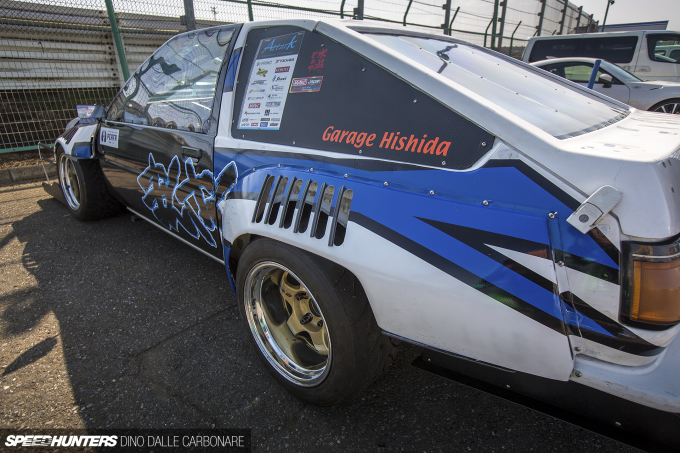 180hp but 1 minute flat laptime is pretty amazing ! Pretty damn sure it can go under a minute with a good driver like Nob Taniguchi behind the wheel! WOW... with only 180hp but can make a 1 minute lap, very impressive! 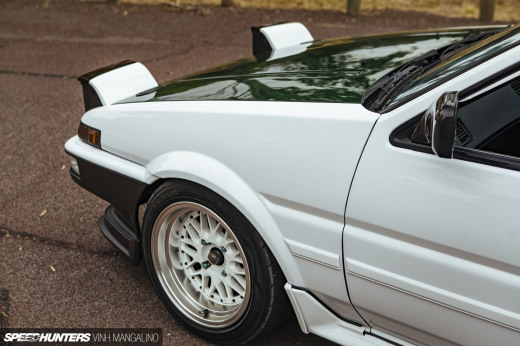 If this little ae86 goes for more, like 350+ hp... the results will be crazy! Anthony959rs Im not sure if the car could handle 350hp. 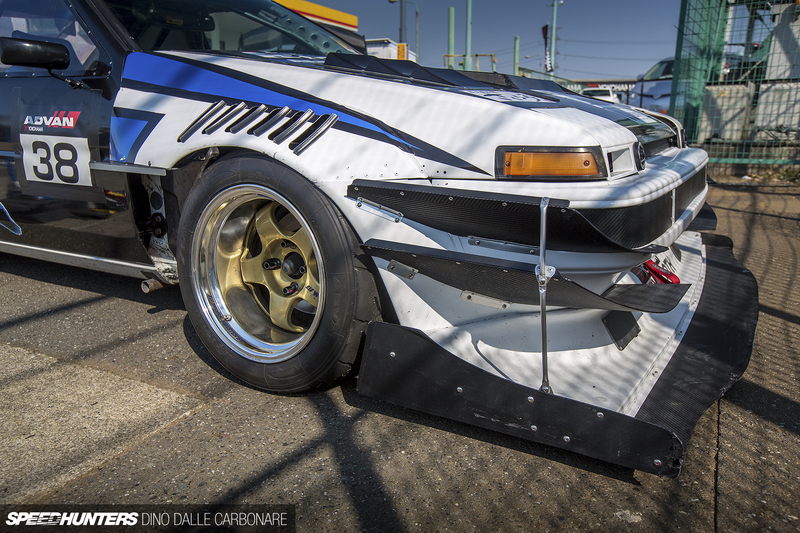 Being so light, It may not get a good amount of grip, even with all of that downforce. RDS altjacobs i hope there's an on board video of this car, and telemetry (it must be a really nice smooth curvature). CharlesChris15 Anthony959rs It should be able to handle 230-250 quite safely. Depends on the circuit. 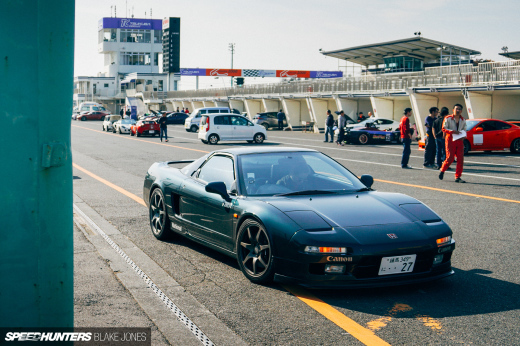 At a track like Fuji, with its long straight, drag can reduce lap times. However, on a track like Taukuba with its very short straights (most people top out in 4th gear on the back straight before braking), drag has much less impact on lap times. Running insane high downforce like this does 3 things. - reduces braking distance. You can stomp the brakes later and harder, as you havr more grip. - increases corner exit speed, which, depending on the length of the straight, can do more to increase top speed at the end of the straight than low drag. The shorter the straight, the more exit speed matters as opposed top end speed. Dimitry Mochkin CharlesChris15 Anthony959rs 250 I'd assume would be good. But 350 might be pushing it a bit. The interior shot is not up to your usual standard there Dino, you must have been in a hurry.